Just across from the Royal Ontario Museum, now on a busy, downtown street corner, sits a Neoclassical building from the early twentieth century. The building, constructed during 1908-1912, was built as an addition to the University of Toronto (UofT) campus. Appropriately, the UofT Department of Classics and Centre for Medieval Studies call this building their home. Yet, inside, visitors can gaze upon a set of beautifully ornate and intricate stained glass windows in Egyptomanian themes. Did you know we have a map of Egypt around Ontario? In 1906, Lillian Massey Treble (1854-1915) donated a half million dollars to UofT to construct a new building for the Department of Household Science. This new addition would house not only classrooms and offices, but also provide a gymnasium and a pool (now no longer functional) for the university’s female students. The founding of the Department of Household Science is significant in UofT history as the first department with female professors. 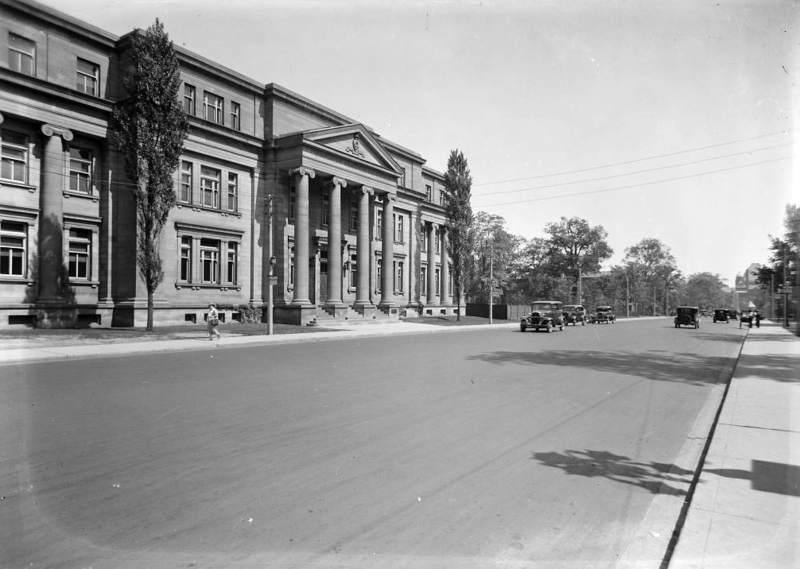 The Lillian Massey Building was designed by Toronto architect, George M. Miller (1854-1933) and built in Neoclassical style with prominently placed Ionic columns. The same architect also designed the Romanesque W.D. Matthews House, now the Newman Centre across from Robart’s Library, which currently houses the Catholic student ministries on campus. In the 1970s, the Lillian Massey Building joined the Department of Nutritional Sciences, and it became the home of the Department of Classics and Centre for Medieval Studies in 2007 after the building underwent renovations. The trio of stained glass windows in the Lillian Massey Building were designed by British artist Henry Holiday (1839-1927), who also designed stained glass windows for Westminster Abbey. The stained glass windows were commissioned with the Department of Household Science in mind – their domestic themes centre around food and textile production. The stained glass windows were installed in 1915, two years after the Lillian Massey Building opened, but unfortunately, Lillian Massey Treble passed away before seeing them. As you enter the building, a grand staircase welcomes you and directs your gaze toward its central window. All located on the east side of the building, they feature brightly-coloured stained glass and appear in a Classical artistic style. The hieroglyphic captions in these windows happily form readable sentences, and were recently translated by Egyptologist Steven Shubert (2). Funnily, Shubert also pointed out that one of the hieroglyphic panels was installed upside-down! The central window features typical Egyptian elements such as the sun-disk which extends its wings above three differently dressed women. According to correspondence in the possession of the Royal Ontario Museum, Lillian Massey appears to not have wanted any Egyptian elements in her stained glass (1) – so are we to imagine ourselves in Egypt in Graeco-Roman times? The figures themselves are freely depicted in contrapposto (with the weight resting on one leg), away from the rigid two-dimensional aspective style of Egyptian art. Above the ladies, a band of hieroglyphs runs on either side of the sun-disk, though covered by leaves. At the very top runs a band of the typical Egyptian khekher-frieze, which we know from a well-known example at Netjerikhet’s step pyramid at Saqqara. It was a common motif decorating the top of walls. Scenes of domestic work and production are commonly associated with tombs of private officials of the Old Kingdom. While these are usually interpreted as representing daily life (3), they do constitute a vast repertoire, which the tomb owner could choose for their own tomb. Over the course of the last few centuries, many drawings and copies of these amazing scenes have been made. Looking at the memoirs of the artist, Steven Shubert noted that Henry Holiday “had access to the voluminous works of [Carl Richard] Lepsius, [Ippolito] Rosellini and Prisse D’Avennes” (4), all noted for their wondrously illustrated volumes of Egyptian art and architecture (see links below). The stained glass window to the left of the grand staircase contains scenes related to food production. In the bottom register, two men squat beside small ovens, cooking a goose, while behind them, two men stand, leaning upon their staffs. In the top register, two women grind grain, while another woman descends a staircase carrying a bowl on her head, presumably filled with freshly-ground grain. While the Graeco-Roman influence in these scenes is both noticeable and appropriate within this Neoclassical building, the stained glass windows also incorporate elements from other periods of Egyptian history. For example, the two men in the background of the bottom register wear wigs characteristic of the Old Kingdom (and perhaps much too fancy for being in a kitchen!). The stained glass window to the right of the grand staircase contains scenes related to the care and storage of textiles. In the bottom register, a man and a woman wash a bundle of linen, while two other men ring out the wet linen by twisting it tightly with a pole. A woman in the centre climbs a staircase to the upper story, where three more individuals are packing the dyed and dried rolls of linen. Three papyrus bundle columns support the upper register, which is decorated with open and closed lotus columns. Steven Shubert, “Egyptianizing Stained Glass in Toronto.” KMT 25, 1 (2014), 69. For an intriguing discussion regarding the interpretation of the scenes of daily life within tombs of private individuals from the Old Kingdom, see the article by René van Walsem, “The Interpretation of Iconographic Programmes in Old Kingdom Elite Tombs of the Memphite Area, Methodological and Theoretical (Re)Considerations”, (1998), p. 1205-1213, published in Proceedings of the Seventh International Congress of Egyptologists, Cambridge, 3-9 September 1995, edited by Chris J. Eyre. Leuven: Peeters. For a thorough and beautifully illustrated publication of the stained glass windows, see the aforenoted article by S. Shubert published in KMT 25(1) (2014), 67-77. Denkmäler aus Aegypten und Aethiopien – This series by C.R. Lepsius was published between 1849 and 1859. Today, a digitised version has been made available through the Lepsius-Project in Germany’s Saxony-Anhalt. Histoire de l’art égyptien: d’après les monuments – This work by Emilé Prisse d’Avennes was published in 1878-1879 and has been made available online through the library of the University of Heidelberg. An English translation, Atlas of Egyptian Art with an introduction by M. Raaven was published in 2007 by AUC Press in Cairo.